A complete guide to 3 amazing rooftop bars in Venice in 2019. So, which is the best rooftop bar in Venice? Find the best Venice rooftop bars with all info you need about each terrace. Opening hours, dress code, pictures, maps and much more. 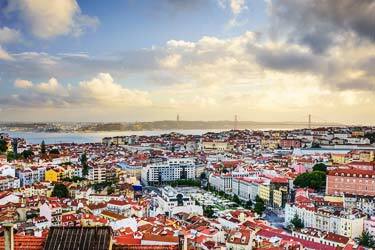 This beautiful and unique city can boost of with some spectacular rooftop bars and restaurants. The closeness to the sea gives unique and fabulous views over the city and its surroundings. Whether you’re in for a romantic dinner och just some afternoon drinks, the terraces here are magical. 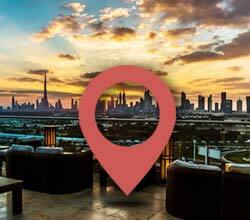 Scroll down and find the Venice rooftop bar best suited for you. Or use the Venice rooftop map in the bottom right corner. 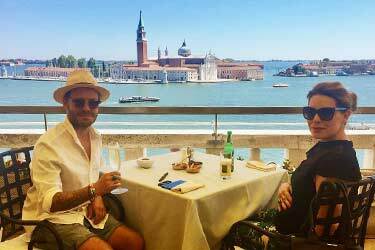 Located on top of the very luxurious Hotel Danieli, just a short walk from from St. Mark's Square, you find this romantic rooftop bar / restaurant with a magical, postcard-worthy view of Venice and the beautiful lagoon. Here you can enjoy Italian fine dining for lunch and dinner year round, and during the warmer months out on the terrace, which then also is open for afternoon drinks, serving fantastic mixologist cocktails, apertevi and a wide range of martini's (among alot of other things). Expect great service in a fantastic and luxurious setting. 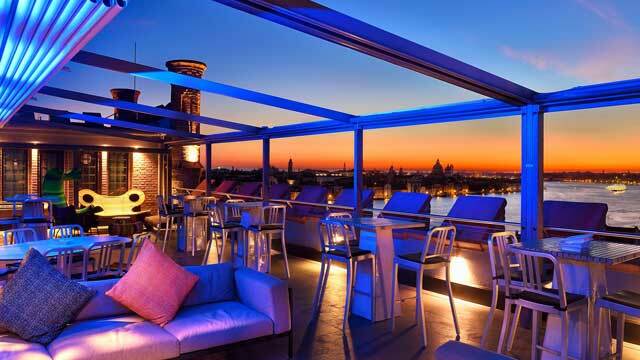 A superb rooftop bar perched on top of the Hilton Molino Stucky Venice, really living up to its name by offering fantastic skyline views, from Canale Giudecca to Piazza San Marco. A chic and stylish cocktail lounge, with a mix of comfy lounge sofas and bar stools and tables more towards to edge. 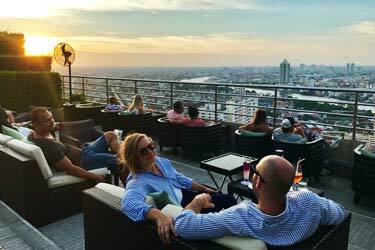 From the rooftop bar you can enjoy crafted cocktails inspired by different parts of Venice along with a set of Italian small bites and salads. 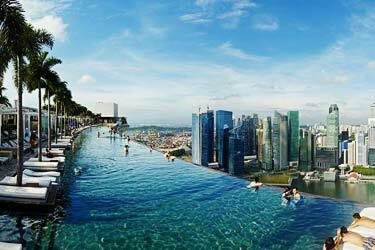 Some summer nights means live music and DJs on the terrace, which also holds one of the world's most stylish rooftop infinity pools. 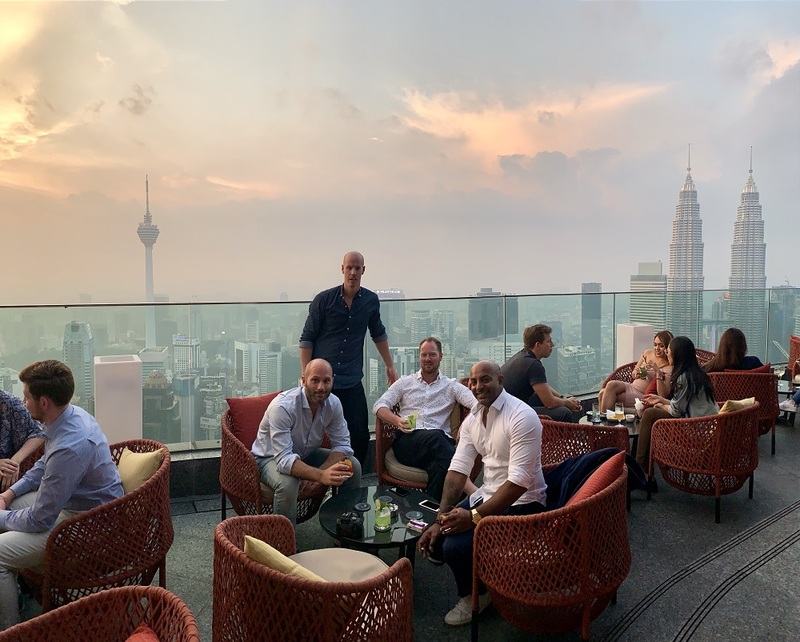 A spectacular Venice rooftop bar, actually the highest rooftop terrace in the city. Here you can enjoy a fabulous breakfast or a cocktail, all to the magical views of the lagoon and the city. 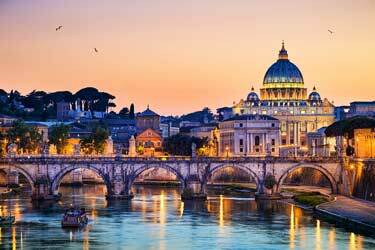 BUT, only if you are a guest at the five star hotel Bauer Palazzo. So the romantic and stylish terrace is very private, and staying at the hotel also means access to an 8th floor terrace with hydro massage bathtubs. Relaxation and views in a perfect mix. Discover the biggest collection of Venice activities, guided tours and skip-the-line tickets. Anything you want you'll find right here. 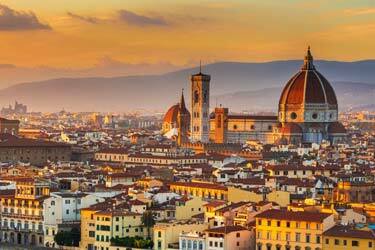 Which are the best rooftops in Venice? This complete guide will help you find the best rooftop bars in Venice. Given that city is very old and rather low-built, the range of rooftop bars in Venice is unfortunately not thatgood. 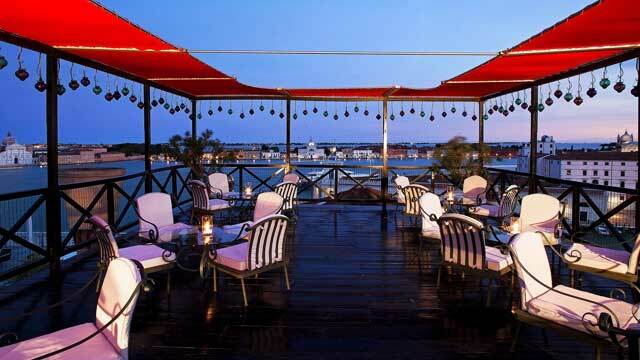 But you can find a couple of good and luxurious Venice rooftop bars that has everything you could wish for. Both in terms of coziness, view over the Venice skyline and for those who want to party all night long. 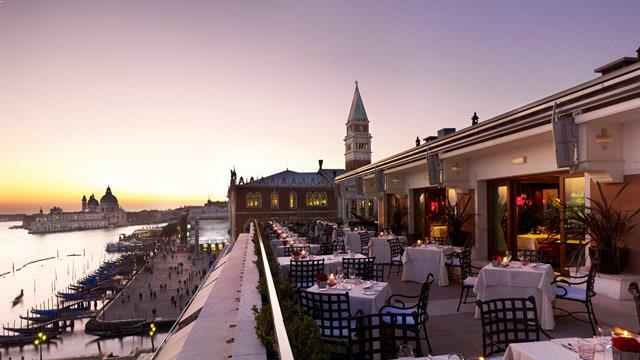 Most of the rooftop restaurants Venice has to offer, are located at hotels or fancy restaurants. You can say that the typical Venice rooftop bar have a beautiful sea view. A Venice Hotel rooftop bar also, in most cases, has superb service and quite expensive prices. So get out there and find the best Venice rooftop bars! And here's a list of the best hotels in Venice with a view. Venice is one of Italy's and the world's most famous cities, mainly thanks to the city being built on islands and that many of the streets here are water in which you take your self around by boat or gondola rides. 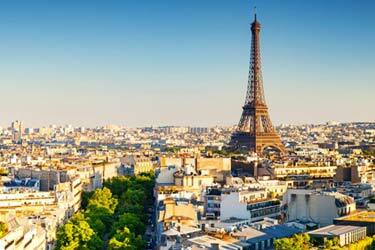 The city is built on the water on millions of wooden poles that are hammered into the mud at the bottom. You can’t take your car here. You have to go by boat, water taxi, gondola or by walking. The streets are often quite uneven and hilly, so for the elderly it can be a bit cumbersome.